This perfectly packaged treat by Mijune Pak pulls in the best of all provinces! 1. Grease bottom of eight 1 cup (250 mL) wide mouth mason jars. In bowl and using fingertips, blend together flour and marzipan until fine consistency. Work in cold butter until mixture has coarse crumb consistency. Using fork, stir in almonds. Mix egg yolk and ice water; pour over flour mixture and toss with fork just until dough comes together. Gather into a ball. Flatten into a disc. Wrap in plastic. Chill for 1 hour. 2. Preheat oven to 375F (190C). 3. 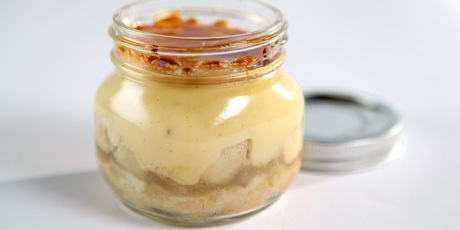 Divide pastry into eight equal portions; press one portion firmly into bottom of each prepared mason jar (not up sides). Pierce a few times with tines of fork. Place on baking sheet. Bake for 25 to 30 minutes or until golden brown. Set aside. Reduce oven temperature to 350F (180C). 1. In saucepan, heat cream, maple syrup and vanilla bean seeds over medium-high heat until bubbles form around edge of pan and mixture is steaming; remove from heat. In bowl, whisk yolks with sugar until thickened and creamy. Gradually whisk in hot cream mixture. Return mixture to saucepan; cook over medium heat, stirring constantly, until custard thickens and coats back of a spoon, about 2 to 4 minutes. Strain through fine-meshed sieve into a bowl. Place piece of plastic wrap on surface of custard. Set aside. 1. Peel and core pears. Cut into 3/4 inch (2 cm) cubes. In nonstick frying pan, melt butter over medium heat; cook pears until slightly softened, stirring gently, about 4 to 5 minutes. Stir in sugar, salt and cardamom until sugar dissolves. In small bowl, whisk cornstarch into 2 tbsp (25 mL) water; stir into pear mixture and cook until thickened, about 30 to 60 seconds. Divide evenly among mason jars. Pour cooled Vanilla Custard over warm pears, dividing evenly. 2. Place mason jars in a large shallow baking dish. Add hot water to half way up side of jars. Bake in centre of oven for 25 to 30 minutes or until custard is set but slightly jiggly at centre. Carefully remove from water bath; cool to room temperature. Refrigerate until cold and custard is set, at least 2 hours. 1. Preheat broiler. Sprinkle each pie with 1-1/2 tsp (7 mL) sugar. Carefully broil until sugar caramelizes. (Alternatively, use kitchen torch.) Serve immediately, or close jars and store in refrigerator. Best served at room temperature.